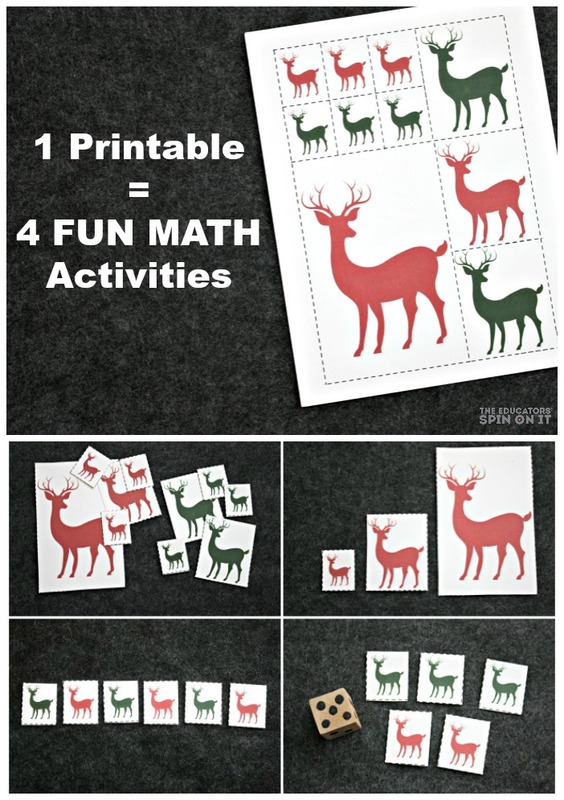 Brush up on early math skills with these fun reindeer math games – all from one printable page! Keeping children engaged and learning all season long is important for learning and positive behavior. It is recommended that preschool age children receive a minimum of 2 hours of interactive, play-based educational time each day. Learning Objective: The child will be able to sort 10 reindeer by size and color. Directions for Play: Provide the reindeer cards to the child. Encourage them to sort the cards in any way they choose. (Don’t give them a hint until you have counted to 15 in your head. Kids need time to think) Many children will sort by color first. Then encourage them to sort the reindeer cards in a different way! 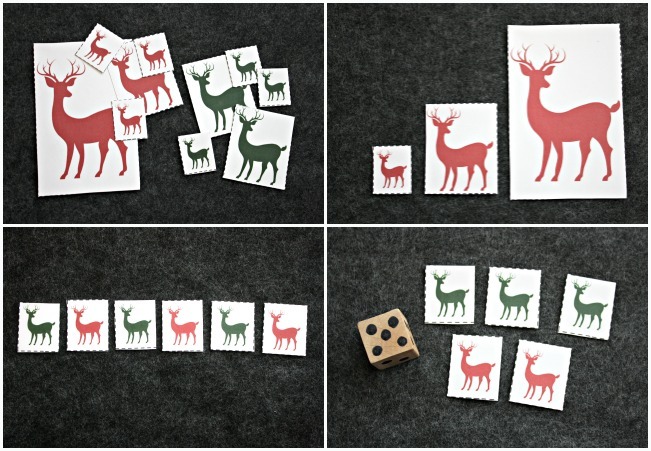 Learning Objective: The child will put 3 reindeer cards in order from smallest to greatest. Directions for Play: Encourage the child to place the reindeer cards in order from smallest to greatest. Have the find the smallest reindeer and put it down first if they need help. Challenge play: Hide the reindeer cards around the house. Have your child search for the smallest ones first, the big ones next and the BIGGEST reindeer last! This activity will incorporate gross motor movement with learning math vocabulary and concepts. Learning Objective: The child will build, read, and extend a pattern in AB order. Learning Objective: The child will count out the correct number of reindeer to correspond to the number of dots rolled on the dice. Directions for play: Have the child roll the dice and count the number of dots on the dice. 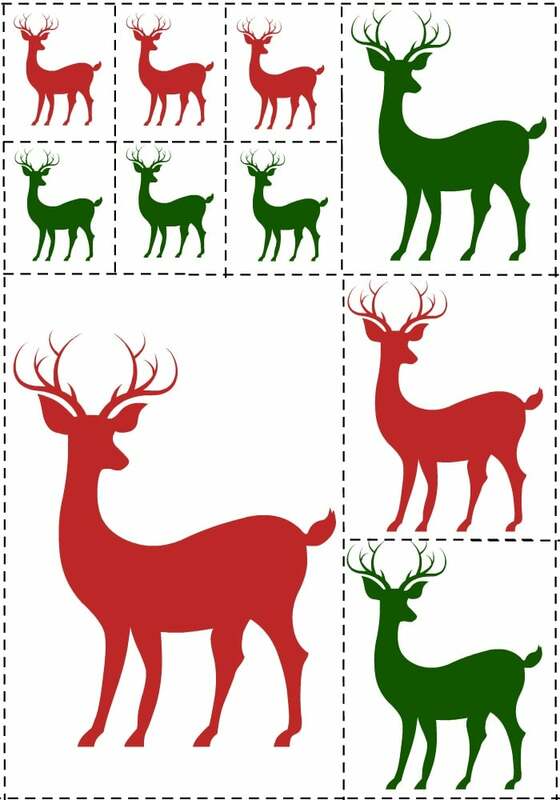 Encourage them to place the same number of reindeer next to the die. Count out loud to check. Repeat. Challenge play: Write the numbers on a piece of paper and start a tally chart for each number rolled. Make a tally on the chart for each time the dice has been rolled. When finished with the activity discuss the results. Talk about what number was rolled the most and the least. Good Ideas Are Best Shared! Pin these activities to your preschool or winter activity board! 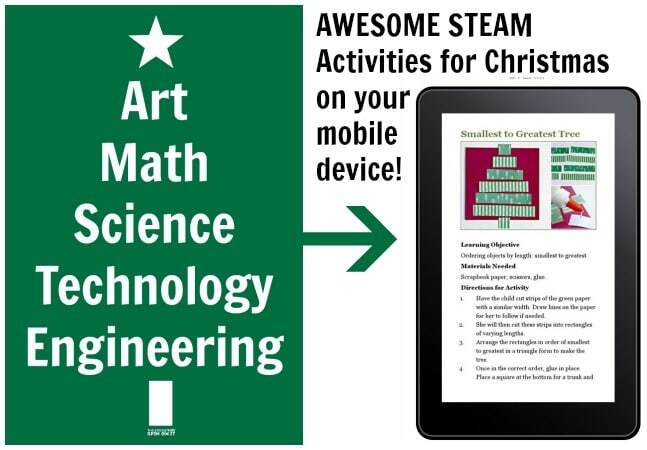 For MORE science, technology, engineering, art, and math activities for preschoolers this holiday season, check out my new e-book STEAM: STEM Activities for Christmas! A great reminder that I need to work on patterning with my preschooler. We will be doing this activity this week! Great hands-on math activities! Thanks for the printable too! I love how you can pull so many games from this printable. These activities will be great for our kids. Thank you for the free printable. I can't wait to try this out. You are welcome! I'm going eco friendly with only one page! Its one that will be great all winter season long! I put the cards in my purse to pull out if needed for a quick activity out and about! I hope they have fun with them. Let me know how it goes! You always have the most versatile ideas! Thank you! Awe – thanks Devany. Although sometimes it is because I don't like making things once only to never use again! Plus – printer ink is expensive! I am really impressed with the collection of the math games. It make the student to think and also will brush up their math skills. 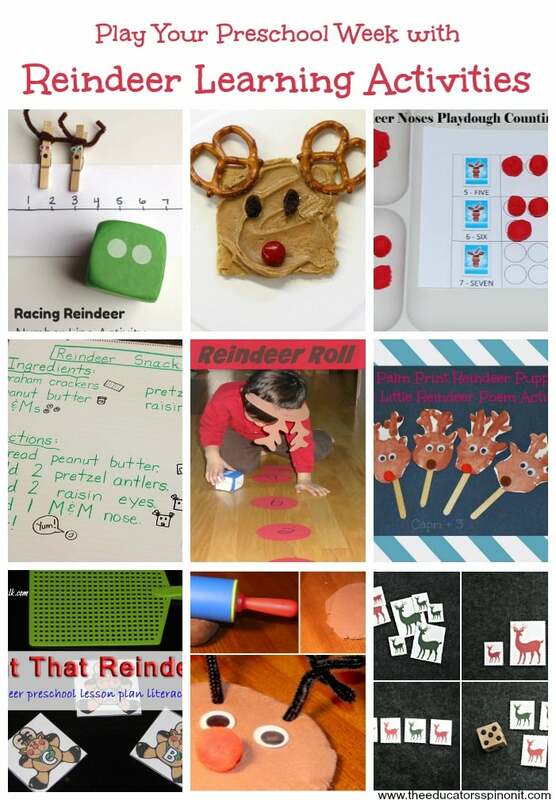 Oh what a great resource – and I'm sure Rudolph will be able to join in these reindeer games! 😉 My preschoolers will love these. Thank you!